If you have a suggestion for a future episode, leave it in the comment section below! The war against the Dominion is not going well, and every Friday Captain Benjamin Sisko posts the update list of Starfleet officers that are either dead or missing in action, and one can assume that Klingon Empire is also taking major losses as well on a week to week basis, but if the Romulan Empire was to enter the war, then the tied could be turn, cause all three major powers of the Alpha & Beta Quadrants would be united against a common enemy (A concept that is a key part of Star Trek Online when you really think about it). So on his own accord, Sisko decides to personally bring the Romulans into the war, but to do it, he needs help… the help of a highly skilled former operative of the Cardassian Obsidian Order… the help of a good tailor… one plain… simple… Garak, who is all too happy to assist Sisko in order to drive the Dominion off of his home world once assured that Sisko is committed to doing what needs to be done. Over the course of the episode we see Garak form and propose a plan to Sisko that involves contacting a Romulan Senator whose voice carries great rate among his people’s leadership to present him with evidence that the Dominion is planning an attack on the Romulan homeworld… this evidence is of course manufactured, and when the plot is exposed, its revealed that Garak had a back up plan to kill the Senator and make it look like he was assassinated by the Dominion, thus giving the Romulans a reason to join the fight. Thus everything was accomplished that need to be done. 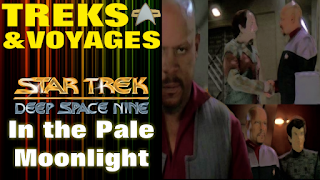 But the real heart of this episode is Sisko, for you see the events of In The Pale Moonlight is being told as a retrospective, Sisko looking back over the previous two weeks and all the decisions he made in order to get the Romulans to enter the war: he got a criminal pardoned from the Klingon empire to produce the evidence needed to give to the Senator, when said criminal nearly kills Quark, Sisko bribes the Ferengi to have him avoid pressing charges, Sisko orders Doctor Bashire to pack up contents of a rare and highly regulated substance in trade for a key item (Bashir complies under protest)… basically Sisko lies, cheats, steals all to get what he wants… but because Garak had the Senator kill, Sisko realizes that regardless of how the result, he got what he wanted, the Romulans to join the fight and he’s going to have to live with that fact, because the end justified the means. Which brings to question the morality of the episode in terms of using less than ‘honorable’ tactics to accomplish a goal, which in a post 9/11 World certainly puts a big spotlight on this episode of Deep Space Nine, because one could say Sisko’s actions and mindset here was no different that those who pushed for Iraq to be invaded, because of supposed manufactured evidence. Sure in the case of Sisko it was to protect the Alpha & Beta Quadrants from the Dominion and it gives the Romulans an opportunity to maintain a status quo of having multiple opponents at an event level instead of one large opponent on all sides… and all it cost was the his self-respect, the life of a Romulan Senator and that of the criminal Sisko got from the Klingons. Beyond that, this episode is notable for the amount of interaction we get between Sisko and Garak who for the most part never really crossed paths much. Garak by and large is such a contrast to Sisko in that he has no issues of morality, he understands whats at stake and knows that at this stage of the war with the Dominion, it’s best to do what needs to be done by any means necessary, because bringing the Romulans into the war would turn the tide, and the price paid was quite the bargain. 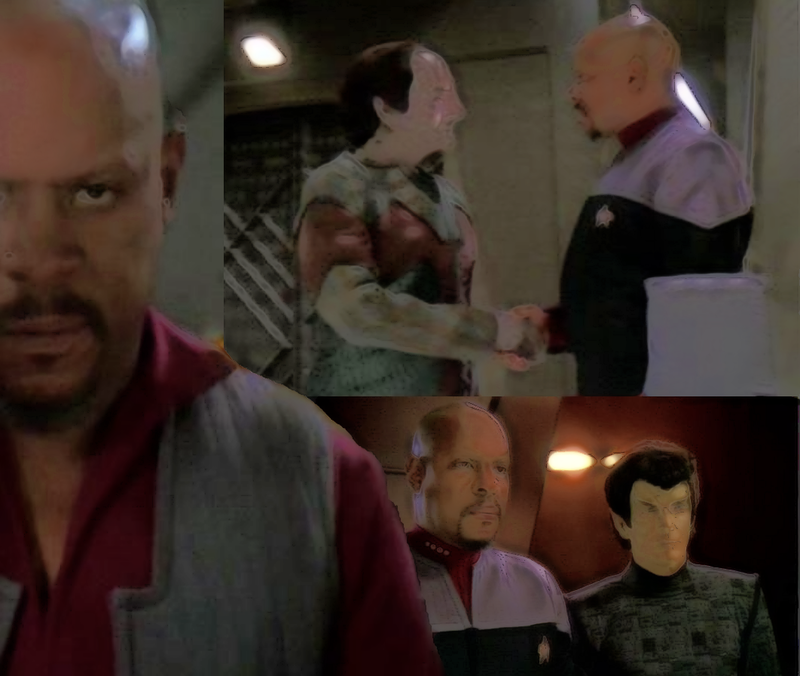 I could go on and on about this episode, as there are individual scenes that just stand out, such as Sisko and Dax role-playing how a conversation with a Romulan would go to try and talk them into the war, pointing out they would need proof instead of speculation of what the Dominion might do if they defeat the Federation & Klingon Empire… as well as the scenes where Sisko is meeting with the Romulan Senator, who has such a cool arrogance about him while listening to Sisko’s arguments, seeing and then examining the fake evidence and giving Star Trek the ‘It’s A Fake’ meme. In terms of an individual performance, one could argue this is Avery Brooks best performance as Benjamin Sisko (note that in Far Beyond The Stars, he’s playing primarily a different character). The reason being is that he’s speaking directly to the viewer / computer as he makes his log entry which is basically a confession, so we are basically sitting back and see how much Brooks has put into the character over the previous five seasons for this episode to show a darker side, which considering where DS9 has gone at this point was perfect timing. 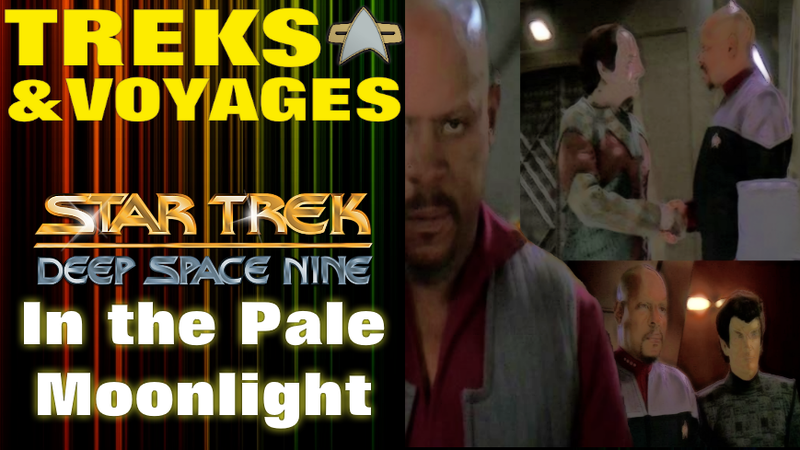 So on that note, I say the following if you have never seen this episode of Star Trek: Deep Space Nine, then well I highly encourage you to check it out, even if you’re not a Star Trek fan, you can appreciate how the story was told and the subject matter. Later this week we’ll take a look at another episode of Deep Space Nine, ‘The Visitor’ and episode that focuses on Jake Sisko and features an actor who just recently was announced to be apart of Star Trek Online, Tony Todd.